We’re giving you the chance to dispose of your old Christmas cards for charity this month (January, 2016). We’ll recycle diners’ festive cards for free from now until January 31 in aid of the Woodland Trust. Marks and Spencer runs the Christmas Card Recycling Scheme and we’re providing a rural drop off point during restaurant opening hours for those that can’t make it into Taunton to the nearest store. All the cards we collect will be passed on to the company to recycle as part of its scheme. We like to do our bit for the environment here and we’re really pleased to be supporting the Woodland Trust by getting involved with the initiative. For every 1,000 Christmas cards collected for recycling, Marks and Spencer has pledged to plant one tree with the Woodland Trust. This year the Trust hopes to collect more than 10 million cards, which equates to the planting of 10,000 trees. The Woodland Trust is dedicated to protecting ancient, and creating new, woodland across the UK. You can drop off your old cards for recycling with us during normal restaurant opening hours from today onwards. For further details, please give us a call on 01278 662629. If you’re coming to see us on Monday (December 7, 2015) for our event in aid of a charity celebrating Somerset’s landscapes, seascapes and skyscapes then you will be able to see a whole host of exhibitors. 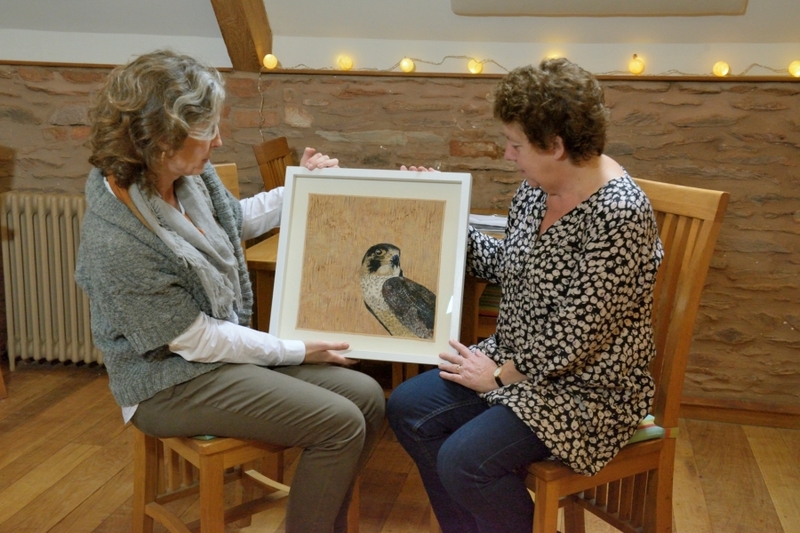 The artists attending include Jackie Curtis from Bawdrip, who produces watercolours and prints and specialises in birds, Tess Armitage, a landscape painter from the Brendon Hills, Annette Regler and Angela Knapp, a textile artist from Castle Cary, who features birds in her work as well. We will also have hand and homemade items from Jane Ritchie, Quantock Lavender, which makes toiletries from lavender grown near us in Broomfield, and gifts from Sammy Lou in North Petherton and Somerset inspired floral arrangements and wreaths by Dotty Daisy also from North Petherton. Providing the chance to sample local wines will be Somerset Wine, Oatley Vineyard and Greenhill Estate. We will also be showcasing our very own Clavelshay Barn Preserves & Liqueurs made at the restaurant from produce grown here on the farm and in our garden. Anyone looking for Christmas gift ideas will be able to see and buy candles made by Louise Drinkwater, recycled glass items and jewellery by Everyone’s Different. It promises to be a fun, free, festive evening out! All the exhibitors, who have all made donations to be involved, are linked with Somerset’s land, sea and sky in some way. Admission is free. There will also be complimentary wine tastings and we will be serving mince pies and mulled wine during the evening with proceeds to the charity too. Clavelshay Barn Restaurant is an award-winning restaurant within a lovingly restored and converted 18th century stone barn at the foot of the picturesque Quantock Hills. Our fundraising art and crafts evening will take place here on Monday, December 7 from 6pm until 9pm. For further details, please call 01278 662629 us or contact us via social media. Well-known textile artist Angela Knapp from Castle Cary will be exhibiting at our charity event in aid of the National Kidney Federation early next month (December, 2015). Angela, who specialises in creating unique images of birds, will be at our Land, Sea and Sky Exhibition on Monday, December 7. She will have a selection of her artwork on show and will also be here to chat to visitors and show them how she creates a piece from start to finish. Angela began her creative journey (in birds) back in 2014 with a blackbird and realised she needed to start experimenting to find a technique using fabric and thread that allowed her to add small details. Angela has always drawn and painted but a move to Somerset in 2008 finally gave her the time to experiment and having discovered the wonders of fabric she bought her first sewing machine. After making lots of traditional quilts and experimenting with textile art in landscapes, she started to experiment with a piece based on a blackbird, 11 pieces later it’s become her obsession! The Clavelshay Barn Restaurant team is organising the exhibition to celebrate Somerset’s landscapes, seascapes and skyscapes while also helping raise funds for the National Kidney Federation, a charity close to my heart. My father, Leslie, aged 86, became very ill last year with kidney failure. He is now having to undertake kidney dialysis three times a week. Suddenly we were thrust into a world of hospital appointments and eventually dialysis. We became aware of the large number of people who suffer from similar problems, and of the amazing job that the dialysis centres do for these patients. The regional centre for renal disease is based in Exeter, where they look after a population of almost one million in Devon and Somerset. My father is lucky to have his treatment at the Taunton Dialysis Unit at Creech Castle, Taunton, which is closer to his home. The care he has been given is exceptional and is enabling him to live a normal life, and my parents were fortunate to be able to celebrate their diamond wedding earlier this year. Our fundraising art and crafts evening at Clavelshay Barn Restaurant will be in aid of the National Kidney Federation and will take place from 6pm until 9pm on Monday, December 7. Admission to the general public is free. There will also be complimentary wine tastings and I will be serving mince pies and mulled wine during the evening too. For further details, please call 01278 662629 or visit www.clavelshaybarn.co.uk. We are looking for artists to participate in an exhibition in early December (2015) in aid of a charity that helped my father. We’re searching for creative-folk with pieces inspired by Somerset’s landscapes, seascapes and skyscapes for our National Kidney Federation fundraiser. Like most of the population, I had never ever thought about kidney disease before. That is, until my father, Leslie, aged 86, became very ill last year with kidney failure, and who is now having to undertake kidney dialysis three times a week. Suddenly we were thrust into a world of hospital appointments and eventually dialysis. We became aware of the large numbers of people who suffer from similar problems, and of the amazing job that the dialysis centres do for these patients. The treatment does restrict my parents’ social life a little, but they can have days out and short breaks away between treatments. The dialysis centres will even arrange treatments away from home, if they wanted to have a longer holiday. As a family, we are so grateful for the care my father has been given, that we felt we wanted to give something in return and have chosen the National Kidney Federation as our charity of the year from now and through to this time next year. Our fundraising art and crafts evening will be in aid of the National Kidney Federation and will take place on Monday, December 7 from 6pm until 9pm. Being a sustainable restaurant serving seasonal food, we’re very closely linked to the local environment so hosting an event like this here with the Land, Sea and Sky theme seemed very apt. All the exhibitors will be linked with the land, sea and sky in some way and will be asked to pay £10 each to be included in the event. The restaurant will provide chairs and tables. Admission to the general public will be free. There will also be complimentary wine tastings. Sue and her team will be serving mince pies and mulled wine during the evening too. Anyone interested in exhibiting, please call me on 01278 662629 or email via query@clavelshaybarn.co.uk. From now onwards when you come and dine with us you will be able to eat and hear the conversation of the other members of your party thanks to the latest in wool technology. So if, like one couple I spoke to recently, you haven’t been back to have your dinner with us for five years because the ambient noise had put you off, please book in again and enjoy our new acoustics! We’ve installed fluffy wool clouds on our ceiling to help absorb the sounds in the restaurant so you can chat without too much background noise. Some people thought we were baaarmy but we are delighted with our acoustic baffles. We knew we had to do something as we’d had a lot of customer comments about the noise on our feedback forms. These days I don’t notice the acoustics, whereas before I was very aware that some customers found it too noisy, now they no longer have to raise their voices in order to be heard by members of their own party or the waiting staff. Initially we trialled them for the makers, the Woolly Shepherd from Milverton near Taunton, and in fact we were the very first restaurant in the country to have their acoustic clouds – so we’re trailblazers! They have been so good for the ambience of the restaurant that we have decided to install them permanently. Woolly Shepherd purchases lower grade fleeces and coloured wools, mostly from smallholders, and converts them into a range of felts designed to maximise the acoustic properties of the wool. The wool boards in the shape of clouds absorb the sound twice, once from below and then again as it bounces off the ceiling. Come and try the clouds out yourself if you haven’t been for a while and also find out why we won our Taste of the West Gold Award this year for our delicious food and top-notch service. Don’t forget we’re open in the evenings from Wednesday to Saturday with dinner served from 7pm – and remember Wednesday is fast becoming the new Thursday as a perfect night for a meal out. We also serve Sunday lunches from 12noon until 2pm. You can book the restaurant for private parties, intimate country weddings and charity and corporate events too. We love holding weddings here at Clavelshay Barn because each one is individual and different. Our philosophy is to do whatever the couple want and to make their day memorable. I had not met Claire, the bride, until the day before the wedding as she lives in Scotland. We had, however, spoken at length on the phone and exchanged e-mails. From our phone conversations I knew this was going to be a slightly unconventional wedding party … and was so looking forward to it. As a former opera singer, she sounded extrovert and fun and that’s what the wedding would be like … and I was happy to go along with her wishes. When we met, she was exactly as I imagined, complete with pink hair! 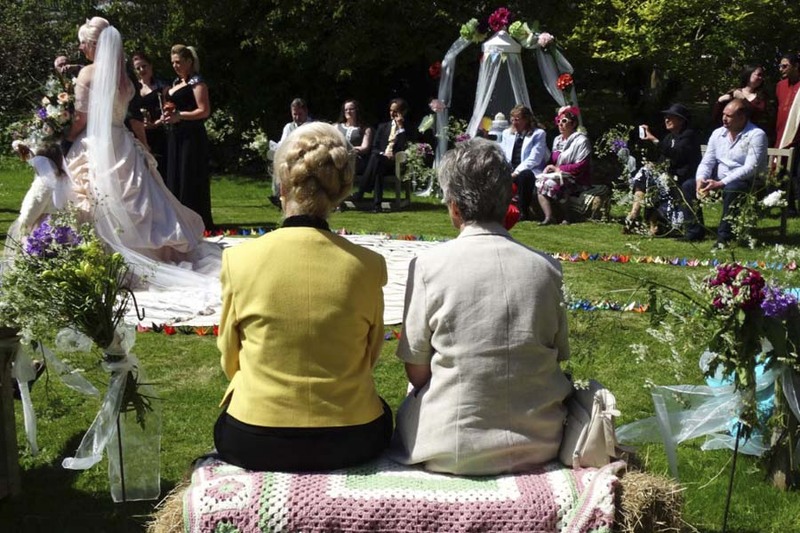 As Claire & Dave had actually married in Scotland, the idea was to have a humanist ceremony here for family and friends, and this was to take place on our lawn, overlooking the valley. The day dawned bright and sunny and soon friends and family arrived to help set up the ceremony space on the lawn. Mother of the bride was given instructions to pick masses of cow parsley en-route and obligingly did so, arriving with cloudy armfuls. Claire arrived with a car load of flowers to put on tables and outside. All was going well, with everyone helping make the perfect setting for the ceremony. Claire had made 660 paper cranes which were placed on the lawn to make a circle, which we had mown earlier. Very useful having stagehands as friends, as all the guests pitched in to make it look as Claire had imagined it. The celebrant was a former opera singer who had been Claire’s singing teacher, known by Claire as “The Duchess” . The ceremony was planned for 1pm. At 11.45 The Duchess swept in and immediately demanded a rehearsal with the groom, who had not yet arrived. A brief exchange of words followed between Claire and the Duchess which resulted in both getting upset. I quickly realised that my job was to keep them apart and keep the peace in order that the wedding went ahead as planned. Claire carried on getting things ready on the lawn and The Duchess retired to her car for lunch, where I encouraged her to stay. I then brought out a glass of Pimms for The Duchess, which seemed to help smooth things over. Eventually the wedding dress arrived and Claire disappeared to get ready, calling for friend Hilary to help lace her into her corset. Claire had told me about her bridesmaids dresses being black but I was not quite prepared for the dramatic fit, nor for them carrying toy dragons and smudge sticks rather than flowers! When Claire walked across the lawn to Dave, followed by their lovely children, Edward & Juno, there was hardly a dry eye in the place. A beautiful hand fasting ceremony followed, with The Duchess pulling out all the stops and being the perfect celebrant. She admitted later that she had been very nervous beforehand and hadn’t known what to expect. After drinks outside, all went into the barn for the wedding breakfast, and the day flew by. Thank you Claire and Dave for allowing us to share your very special day. P.S. Did I mention the 3 wedding cakes, including the 50 shades of grey cake? All beautifully made by Dave’s Mum –which was probably above and beyond the call of duty. Are you fascinated by the night sky and wish you knew more about it? Now is your chance to learn from an experienced astronomer. We are lucky here on the Quantocks to have very little light pollution so that we can usually see the stars clearly. • The Moon will be rather low in the west and a dramatic thin new crescent. Above it, Venus, which will be visible before sunset and very bright after itAbove that and to the left (south) will be Jupiter and all four big moons should be on show. • Above that and to the left (south) will be Jupiter and all four big moons should be on show.Right round in the south east is Saturn. If we can see it, Saturn is beautiful. The rings are quite well placed and Titan might be visible as a starlike dot. • Right round in the south east is Saturn. If we can see it, Saturn is beautiful. The rings are quite well placed and Titan might be visible as a starlike dot. Fingers crossed for a clear night – can’t wait! Bookings essential – please contact Sue on 01278 662629. Please bring warm clothing, and binoculars or telescopes if you have them. Join Bushcraft Instructor, Greg Power for a day of bushcraft activities that will focus on the four areas of shelter, fire, water and foraging in the grounds of Clavelshay Barn. Here is a tiny taster of the course content. Greg has the answers for you. • What is a crampball? • Why does a hammock need a wick • What tree must you never, ever, ever camp under • What is the most practical water purifying technique? This bushcraft workshop has been designed to spark your interest in the glorious British countryside. It will give a taster in to how you can explore it further and do so comfortably. All the necessary tools and materials will be provided, however if you would like to bring a camera or notepad please do so. There are no pre-requisite skills required for this course; however comfortable walking boots and appropriate clothing for the weather are a must. Lashings of tea and coffee and a bushcraft lunch of game or fish, cooked over an open fire are included in the workshop. Please advise of any special dietary needs when booking. A kit list, nutritional/medical needs form and directions will be provided once the course is booked. *Open at other times for private events by arrangement.